1940 Graduated from St Charles preparatory school in 1940. Times were tough so Bill joined the three C (Civilian Conservation Corp) camp in Caldwell, Iowa. Joined the BR 29 which was his indoctrination into army life without being in the service. 12/1941 Decision to enlist or wait to be drafted, upon the marriage to his wife Bill decided to wait to be drafted. 1943 Sent to St Petersburg, Florida for training in the Army Air Corps then went to Amarillo, Texas air force base for B-17 mechanics school. Top two students were offered the opportunity to go to B-29 school so Bill volunteered then went to Sinoot Field then to the B-29 factory in Seattle, Washington. The B-29 Superfortress was the best school he had ever attended because the men who built the plane taught him. 1944 Bill was then transferred to Caldwell, New Mexico. 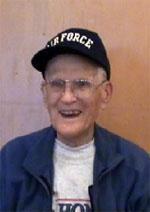 Bill was supposed to join the 20th air force but missed them by just a few hours after they were deployed. Bill was in limbo for a couple weeks then went to Salt Lake City, Utah then overseas. After going to school for B-17 and B-29 both four engine planes once arriving in New Guinea Bill was assigned to be the electrical engineer on the two engine B-25 Mitchell. Mostly flew missions to Borneo. Then went to the Palau, Philippines in support of Ho Chi Minh missions to Indo China and South China Sea. 1944 Bill has documents on the Palau Massacre were the Japanese made 150 American POW built an air strip by hand. When an air raid siren went off they put all the POWs inside, lit the building on fire and shot the prisoners. Only a few of the 150 survived being murdered. Sent to St Petersburg, Florida for training in the Army Air Corps then went to Amarillo, Texas air force base for B-17 mechanics school. Top two students were offered the opportunity to go to B-29 school so Bill volunteered then went to Sinoot Field then to the B-29 factory in Seattle, Washington.